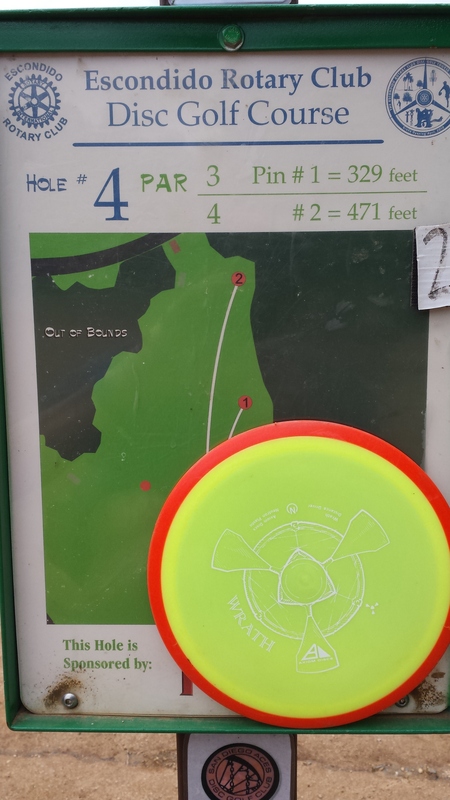 The overstable distance driver can be quite the enigma for low-powered disc golfers. Grab something too beefy, and you’ve got yourself a short-range meathook out of the gate. Try to compensate for the overstability by dropping to a lower weight, though, and oftentimes you tend to lose some of a disc’s reliability in the wind. It’s all about finding that happy medium, and a lightweight Axiom Discs Wrath can help you find that bliss. The follow-up to the popular Insanity, the Wrath is Axiom Discs’ second release in the company’s 20-millimeter rim width class of distance drivers. Described as a mold that “brings a worn-in flavor to the beloved Tesla flight profile,” it sits squarely in the stable-overstable category that can give noodle arms fits. Fortunately, Axiom Discs kept that in mind and sent a 152-gram Wrath for me to give a spin. As a result, I was able to get a good grasp on how the mold would operate without having to worry about not being able to get it up to speed. And, as luck would have it, the wind was howling the day I got the Wrath in the mail. So I was able to put its wind-fighting integrity to the test. Heading to the field with a new disc is always kind of like a first date for me. There are some nerves, I’m not quite sure what I should wear, and I want to click with the disc right off the bat and build a solid relationship. (OK, only part of that is true.) It’s difficult enough trying to learn what a disc will do in calm conditions, but add wind to the mix and it’s as if the disc’s ex- is coming along and playing third-wheel. You can’t ever really get too comfortable, and you’re such a nice guy or gal that you’re probably footing the bill for three. Needless to say, I was even more nervous taking a 150-class driver out for its initial field session, especially given my track record with less-than-heavy discs. Don’t get me wrong; lightweight plastic is the stuff of noodle arm dreams. It gives easy distance and usually serves as a tool to diagnose form flaws. In the wind, though, it can turn into trash blowing out the back of someone’s pickup truck as it speeds down the freeway. It’s everywhere. I was quite pleased, then, to find that the Wrath more than held its own into a headwind. Where other molds in lower weights during the same field session either straightened out or turned over (the recently-released Fission Volt and a Dynamic Discs Air Escape, respectively), the Wrath simply held straight and still finished with a reliable, strong fade. It flew like I was throwing a max-weight disc, but took the effort of its natural 152-gram measurement. This experience in the field proved to be a proper introduction to how the Wrath would fly on the course. The Axiom Discs Wrath has the right mix of stability and control to shape classic golf lines. Given its stable-overstable label, the Wrath naturally works best on straight power lines when it comes time to hit the course. Thrown flat, the disc displays a hefty amount of high speed stability, followed by a fade of the same nature it displays in the wind. Give it some hyzer, and it holds a long hyzer line that can end with a massive skip. Interestingly enough, though, is the amount of high speed turn that I can coax out of it with just the slightest anhyzer release. It will hold a long, smooth turn for about three quarters of its flight before settling back into the overstable fade route, which makes it phenomenal for flex shots. Hole 4 at Kit Carson Park has seen the Wrath quite a bit in the short time I have had it. The tee shot features a lefty-friendly line that plays with some nasty brush off to the right, but a headwind can come over a small ridge to turn a more understable mold over and send it veering into an adjoining fairway. What I’ve found here is that I can throw the Wrath on a slight anhyzer and let it ride left for a bit before coming back with a big enough skip to get me close to the pin but safely in bounds. Anything more flippy runs the risk of catching that breeze and ending up way off the mark, and anything more hefty fades early and into the bushes. The Wrath strikes a nice balance. For all of its classic uses, though, the Wrath is still an overstable distance driver, and as a result noodle arms need to heed a bit of caution. If you are looking for instantaneous added distance, you’re not going to find it with this mold. It still requires a certain level of power to absolutely bomb, and you’ll know for yourself whether you have that power. Where you make up for that sacrifice in distance, though, is with accuracy. The Wrath is very easy to range, and its fade is consistent enough to where it is not difficult to control. In that regard, it ends up being shorter than the aforementioned Insanity by about 20 feet or so, but you can be confident in where it is going to land. Plus, it makes a great utility disc, even at its low weight. I don’t throw overhand shots very often, but when I have, the Wrath has been excellent. With a tomahawk grip, it pans over very slowly and essentially lands straight in line with where I released it. On a thumber, it displays some useful lateral play and flips over a bit more quickly. I’ve actually taken to this throw quite a bit, as it really opens up some nice opportunities for getting out of trouble or avoiding obstacles in general. On the whole, I’ve found the Wrath to be a useful addition to my bag. It is easier to throw than other stable-overstable discs in this speed range, such as the MVP Tesla or Discmania PD, and its extra utility has helped me pare down my molds a bit. Where I was carrying overstable putters and fairway drivers before in case I needed something to handle a tricky flick shot, I can cover both slots by simply powering down on the Wrath. It all comes back to that happy medium, and the Wrath has a knack for finding it. You can Tweet this once a day until a winner is drawn on Wednesday, May 20. Each Tweet is an entry, so get on it! Thanks to Axiom Discs for supporting Noodle Arm Disc Golf!